February 1910. Buffalo, New York. "Home of the Palia family, 260 Terrace Street. The boy, Amorica, center, goes to the canning factory with his mother in summer." 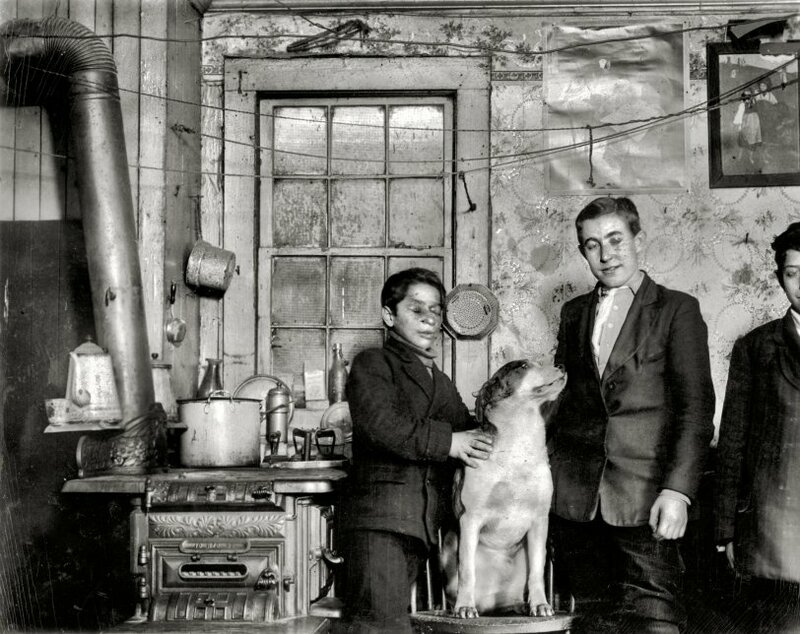 Photograph and caption by Lewis Wickes Hine. View full size. Submitted by munchdog on Tue, 01/29/2013 - 1:20am. I recall my Irish grandma stringing rope everywhere when it rained. The whole apartment was humid and smelled of laundry. But we were kids, and that was just how Grandma's house smelled. I still have a 'foam fabric' jacket with the words 'Kalamazoo Stove' melted into it in reverse. I should have taken it off before backing up to the heat! Submitted by Carey on Fri, 10/21/2011 - 11:02pm. easily my favorite dog on Shorpy. Submitted by perpster on Wed, 10/19/2011 - 10:58pm. Maybe the boy on the right was a half-brother. Submitted by gen81465 on Wed, 10/19/2011 - 12:37am. Either there are some serious flaws with the photo, or the boy with the dog was recently involved in some kind of accident or beating. His eyes appear badly swollen, and the left one appears ready to pop out of his head. Could this have been work related? Submitted by Mattie on Tue, 10/18/2011 - 7:56pm. Looks like the dog was the only one who was able to keep his eyes open during the exposure. There must've been some delicious people food just out of the frame on the right. Submitted by PersonFromPorlock on Tue, 10/18/2011 - 6:28pm. Submitted by Bill Cary on Tue, 10/18/2011 - 11:35am. There are four males in the photograph and the only one the photographer did justice to has four legs. The three humans blinked and weren't centered in the image. However, both the dog and the door came out great. Submitted by CPLgrumpy on Mon, 10/17/2011 - 10:05pm. It looks as if both of those boys are sporting a shiner. You have to wonder if it was from the streets or at home. Submitted by Sharon King on Mon, 10/17/2011 - 8:01pm. Gives the family name as Paglia. Americo is about 14. Submitted by Vintagetvs on Mon, 10/17/2011 - 7:26pm. Were they dead when this was taken?